Photoshop CS6 is the latest version of Adobe's flagship editing program. The first change you'll notice in this release is the revamped interface. Part of this is cosmetic - it's much darker than before - but there are plenty of functional changes, too. Cropping is arguably easier, properties panels fly out, and there are a host of other optimisations dotted around (the Liquify interface is notably simplified, for instance). Extended content-aware functionality sees the addition of a Content Aware Move, which enables you to draw around an object and move it to another part of the image, while Photoshop intelligently fills in the background. This doesn't always work, unsurprisingly, but a Content Aware Patch option means you can give the program a little assistance, where necessary. Layer enhancements see Shape Layers replaced by Vector Layers, which can have a stroke and a fill (solid colours, gradients or patterns). New blur options - Field, Iris and Tilt-Shift - help you to adjust your depth of field and decide exactly which parts of the photo you'd like blurred, and all with convenient on-image controls so you get a full-sized preview of the results. There are a host of improvements elsewhere. Adobe Camera Raw 7.0 is easier to use, and offers new Shadow and Highlight controls; the Adaptive Wide Angle tool provides more control over lens corrections; image autocorrections are more intelligent, the rewritten 3D engine is faster and offers additional options, and the program's painting tools have been extended with new erodible brushes. None of this seems quite enough for Adobe, though, who with this release have also greatly extended Photoshop's video functionality. 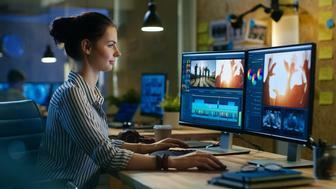 The new video import engine can handle a wider range of formats, including AVCHD; a new Timeline panel presents your video more intelligently; and you can add a separate audio track, drag and drop transitions and fades, and easily cut, splice and preview clips to produce the results you need. Please note, the download here is for Adobe's Download Manager, which you'll have to use to grab and install the full version of Photoshop for you. This takes a while, though - it's a big 1.2GB download - so you'll need to be patient. Photoshop CS6 is a major update for the package with some valuable new features (it's becoming a surprisingly capable video editor, for instance). If other graphics editors just don't deliver the power you need then this is a must-try.